Eve made a deal with Death, sealed by the serpent. Did you knew what you've done when he took you by the wrist? 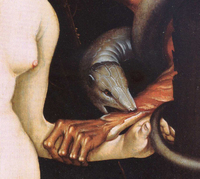 ... fondle the serpent, so gently, dear. ... and her sophisticated "frightened" face shows her thoughts.